UPDATE 2.48pm: CYCLONIC winds are causing chaos for travellers today. A Ballina Byron Gateway Airport spokeswoman said weather conditions had caused the cancellation of all Jetstar flights today. She said while there is a Virgin flight scheduled from 3pm this afternoon, airport staff had not heard of any cancellations for the airline. With winds expected to pick up overnight, the spokeswoman said airlines would most likely wait to see what the weather would bring before making the decision to cancel any flights throughout the weekend. Ballina Byron Gateway Airport advises travellers to contact their airline for updates. UPDATE 2.17pm: A HELICOPTER is offering a bird's eye view of conditions along the North Coast as the SES looks to understand what impacts Tropical Cyclone Oma is having on the New South Wales coastline. The Rural Fire Service's Firebird 200 has been tasked with flying from Evans Head to Tweed Heads and over low lying coastal areas, providing surveillance on tidal conditions, erosion and potential flooding. Currently the Bureau of Meteorology has a Severe Weather Warning in place for abnormally high tides, damaging and hazardous surf, and damaging winds, covering and an area from Tweed Heads to Coffs Harbour. NSW SES Operations Commander, Mark Somers said the view from the sky allows the SES to make more informed decisions about where assets are needed in order to best protect the community. "Despite the strong winds, we have been able to deploy the Rural Fire Service's Firebird from Lismore Airport, to assess what impact exactly these strong surf conditions are having on the coast line and residents. "As gale force winds continue we are expected substantial beach erosion to occur, which could lead to low level sea flooding in areas like Belongil, Brunswick Heads and Kingscliff," Mr Somers said. As the weather event continues the Firebird will provide daily updates on the coastal conditions, offering a comparison of the changing landscape. For more FloodSafe and StormSafe information and a copy of a Home or Business Emergency Plan go to www.sesemergencyplan.com.au . UPDATE 1.12pm: Beach vehicle access north of Coffs Harbour and a number of camping and visitor areas in the Northern Rivers area have been closed until Wednesday 27 February for public safety, due to dangerous conditions associated with Tropical Cyclone Oma. As Cyclone Oma approaches the coast of south east Queensland, large swells, wind and possibly heavy rain is expected to impact along the NSW North Coast, in particular in the coastal areas of Tweed, Byron, Ballina, Yamba and Coffs Harbour with conditions expected to peak tomorrow (Saturday 23 February). "All beach vehicle access and pedestrian access in National Parks and Wildlife Service areas along the north coast between Coffs Harbour and the NSW/QLD border, as well as a number of campsites and day use areas in the Northern Rivers area, will be closed until Wednesday 27 February", NPWS Director Russell Madeley said. "Forested areas during a cyclone or severe storm have a high risk of falling limbs and trees", he said. "Until Wednesday 27 February people are strongly advised to avoid the beaches and national parks on the North Coast. "Gale force winds are also forecast for the Byron and Coffs Coasts. The Cape Byron lighthouse precinct will be closed if winds reach more than 95kph", Mr Madeley said. All beach vehicle access north of Coffs Harbour. Black Rocks and Woody Head in Bundjalung National Park. Sandon and Pebbly Beach in Yuraygir National Park. Forest Tops and Sheepstation Creek in the Border Ranges National Park. Rummery Park in Night Cap National Park. Wollumbin National Park in the Tweed Byron Area. Clarkes, The Pass, Wategos and Tallows beaches at Byron Bay. "For people's safety, and that of the emergency service staff who might be required to provide emergency assistance, people should carefully consider the need to visit areas impacted by Cyclone Oma until they are declared safe," Mr Madeley said. "If travel cannot be avoided, be sure to check the NPWS website as well as advice from the NSW State Emergency Service and weather warnings from the BOM. "NPWS will be actively monitoring the cyclone situation over the duration of the weather event and assess the damage once the storm has passed. "We will re-open parks, campsites and beach vehicle access when visitor safety can be guaranteed," he said. 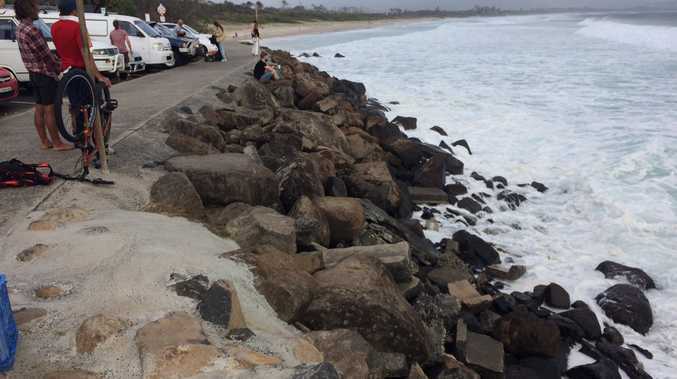 UPDATE 12.45pm: A POPULAR Byron Bay holiday accommodation business said they have closed a beach access track and are assessing damage in the wake of Cyclone Oma. Reflections Holiday Park's Capital Words executive manager Jack Plimmer said the Clarkes Beach resort has weathered the storm surprisingly well. "Our end of the beach is fine and holding up not too bad," he said. "It's worse towards the Pass end of the beach." Mr Plimmer said while the sand dunes are "holding up pretty well", they have closed on of the paths. "We have closed the beach access from the Pass at the southern end until we an engineers report," he said. "Some of the timber footings are a bit loose in the sand." He said once the worst is over on Tuesday, they will have a team out to access what needs to be repaired. "We will redo the fencing and have a clean-up," he said. UPDATE 11am: The Bureau of Meteorology has issued a Severe Weather Warning for damaging winds, abnormally high tides and damaging surf for today and tomorrow in the Northern Rivers. As of 6am AEST on Friday, tropical cyclone Oma (category 1) was located 710 kilometres east northeast of Brisbane. It is expected to continue moving in a generally south to southwesterly direction during Friday and early Saturday. Oma's motion becomes slow moving to the north during Saturday, remaining offshore through the weekend and early next week. Locally damaging winds gusts in excess of 90 km/h may develop about the exposed parts of the coast near the Queensland border today and into Saturday. These damaging wind gusts may extend to the northern border ranges later today. Beaches closed on North Coast: Byron Bay lifeguard supervisor Steve Mills talks about the dangerous conditions. UPDATE 9.40am: TROPICAL Cyclone Oma may have been downgraded but authorities are still warning big waves, strong winds and high tides will swamp the far north coast. While there continues to be uncertainty over the movement and intensity of TC Oma, Byron Council is expecting significant erosion of some Byron Shire beaches from large waves and king tides. According to Byron Council, Clarkes Beach and the Pass are already severely depleted of sand and there will be further erosion of the sand dune system including vegetation. Byron Shire Council, Coastal and Biodiversity Coordinator, Chloe Dowsett said despite Cyclone Oma being downgraded they are expecting big swell and beaches are closed. "Our beaches will have some be erosion of sand and vegetation (such as) at the Pass where there is not much sand," she said. "No property is threatened, even at New Brighton. "There's no cause for concern although there may be some lowering of the beach at New Belongil." Ms Dowsett said Council is monitoring the situation closely. "We are coordinating beach access, dune fencing and road closures if needed," she said. "The SES are the main agency and we will monitor the situation on Friday and across the weekend." A State Emergency Service spokesman confirmed their severe weather warning is still in place. "The SES severe weather warning remains in place and we want people to be aware of hazardous and dangerous surf," he said. 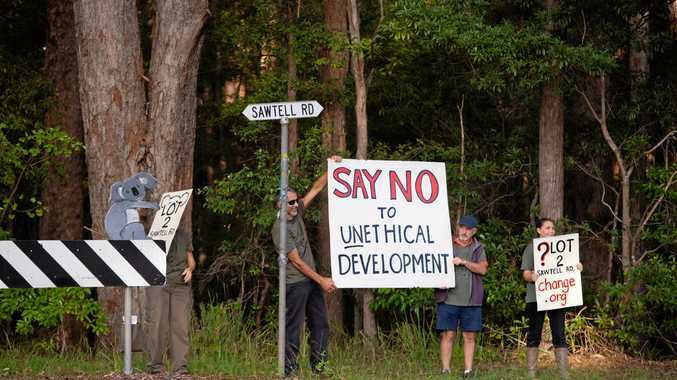 "The coast is being affected from Tweed to Ballina." The SES also have two helicopters are on stand-by to assess damage and coastal erosion. "If the weather allows, we have the choppers ready to undertake aerial surveys to assess the extent of the coast erosion," he said. "But this depends as gale force winds are also expected to sweep through the region over the next few days and they could be in excess of 90kmph. "The SES expects they could continue over the weekend.". Original story: NORTHERN NSW is being closely monitored as Tropical Cyclone Oma continues to move toward south-east Queensland, with a cyclone watch issued from Bundaberg to Ballina. The category two cyclone - which has been given the title 'Omageddon' on social media, entered Australia's area of responsibility earlier today and is continuing its ominous approach towards the Queensland coast. "We're watching this system closely for impacts for the northern NSW coast," BoM said. Dangerous surf conditions will bring waves up to eight metres and winds are expected to exceed 70km/h over the next few days, with a Strong Wind Warning for Byron Coast in place today and a Gale Warning for tomorrow ahead of Oma. A Severe Weather Warning for Abnormally High Tides and a Hazardous Surf Warning are also current. BoM's current forecast also includes a good dose of rain for parts of the Northern Rivers - with some towns predicted to receive more than 200mm from Friday into next week. Lismore could see heavy falls on Saturday with up to 100mm of rain predicted. Up to 130mm could fall in Ballina over Saturday and Sunday, and more than 100mm for Byron Bay. State manager for bureau NSW Ann Farrell said Queensland and Northern NSW will see impacts from the cyclone over the next few days even as it remains offshore. "For Northern NSW we are looking at abnormally high tides...which could cause some inundation in low-lying areas. We're seeing some north-easterly swells coming in and that will create very hazardous surf conditions which we are already starting to see and they will increase. "We're also expecting winds to increase and as the systems gets closer we're expecting rain to sweep in. "The beaches will be unsafe over the coming weekend in Northern NSW. "By the weekend there is the potential for damaging gusts depending on the movement of the system. "Potentially severe weather warnings will be on the cards." "Oma is expected to bring gale force winds, enhanced rainfall and very powerful surf to the north coast for the next four days. The SES is urging all Northern Rivers residents as well as visitors staying at caravan parks to secure annexes and any outdoor items that may blow around during these winds. "Beachfront houses should prepare for big swells and possible coastal erosion, especially in areas such as Kingscliffe, The Pass, Clarkes Beach, Main Beach and Belongil, New Brighton and beaches in the south of the Byron Shire (Suffolk and Tallow)," Mr Somers said. NSW SES Community Capability Officer, Janet Pettit said residents in the Northern Rivers need to be alert, not alarmed. "The SES is urging residents to prepare their properties by tying down loose items, trimming tree branches close to houses and ensuring gutters are clean and in good condition." Surfers tackle swell at Byron: Finn Crisp, of Byron Bay, looking for good conditions at the Wreck at Byron Bay.